washable & sewn: with 10 pieces of fabric, 6 pieces of Therm o Web Ultrahold patterns, ribbon to connect the bottom right of strut leg pocket to behind the easel back panels, button holes for hanging the frame vertically & horizontally using the zigzag stitch on the sewing machine, a pocket for each of the removable mat board easel board and strut leg boards, pocket in the front for the photo and it's protective sleeve, which is a clear, acid free, sheet protector, cut to the size of the photo. washable & no sew: this one is similar to the washable, sewn frame, with a twist - you still use a ribbon to connect the strut leg pocket to behind the easel back panels, but also another length of ribbon, 1/8" wide, skinny ribbon, 2 feet up to 7 feet long, thread through holes on 3 of the 10 fabric AND Ultrahold panels, that you poke and cut out with pointy, sharp scissors (embroidery scissors, but buy a separate pair from your sewing embroidery scissors), also holes on the 2 easel back panels for hanging the frame. the top part of the strut leg is hot glued to the easel back, and the pattern for the strut leg has a strip about 1/4" to 1/2" cut away, but used for spacing the top and bottom of the strut leg- this space allows for the strut leg to bend or pitch out. 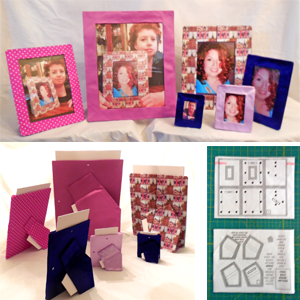 The 3 panels with ribbon thread through holes makes the photo pocket for the photo to stay situated! fabric covered mat board parts for frame: YES, I cut up mat board for 4 parts - the frame front border board, easel back board, 2 part strut leg with spacer for bending, and add a U shape piece mat board, which you can cut 3 strips or use the pattern in the download, and trace around them. Only the edge gets covered, and fabric is glued down to the flat, front and back of the mat board, as to not show or seep out adhesive on the edge. The top of the covered strut leg, similar to the "washable & no sew" way, with the spacer to make the strut leg bend, covered on both sides, is stapled AND hot glued down, ribbon connects the bottom to the covered easel back board, covered on both sides. The u shape piece allows for the photo to shake out, or slide out, and give your fingers space to take the photo out. 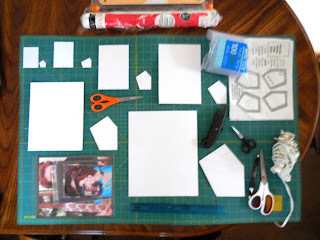 The 4th way of making fabric covered mat board photo frames, is having 2 holes, both on the top of the 2 part strut leg & the easel back, using a quality hole puncher, but for the bigger frames, you can use a craft knife. Then, ribbon is thread through the holes connecting the top of the strut leg to the easel back. 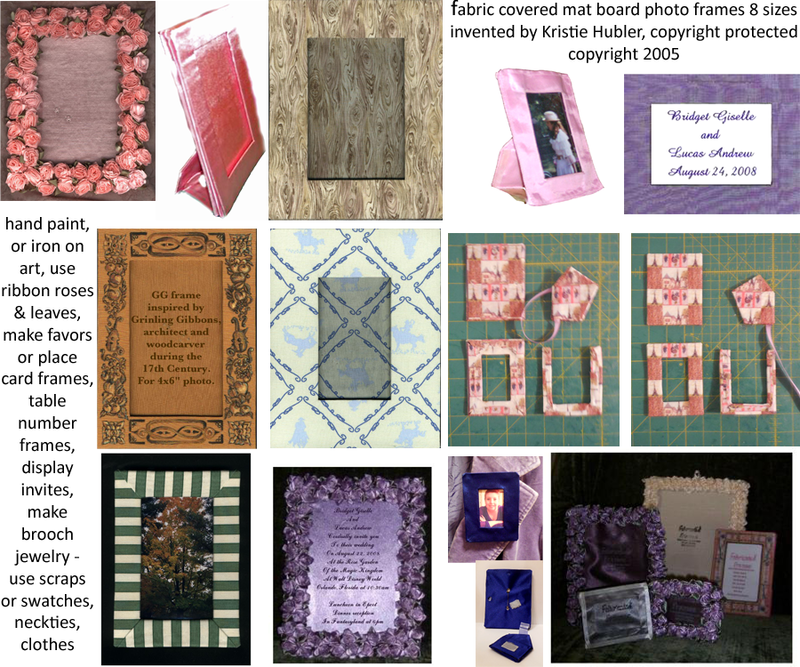 The rest is similar to the other way of making fabric covered mat board frames. mat board: the fabric covered mat board frames require the most mat board, or you could use cardboard 1/16" thick, while the washable, no sew frames use the least amount - both the washable, sewn & no sew only use mat board for the easel back board and strut leg board, where the washable, no sew frame's strut leg uses less mat board than the washable, sewn frame. You can buy 32x40" mat board for $8 at Michaels or AC Moore, some stores carry 20x30" mat board for $5, JoAnn Fabrics sells scraps in 8x10" size for $1 in their framing department. ribbon: most of the time you'll need a 9" length of ribbon, width depends on the frame, 3/8" wide for small frames, up to 1 1/2" wide for the larger frames. For the washable, no sew frames, you'll need a long length of 1/8" wide by 2 feet to 7 feet, depending again on the size of the frame. Oh, and also about a 1 foot length, 3/8" wide is popular, to thread through the holes on the top of the strut leg and through to the easel back to connect them. Clear, acid free, sheet protector pages: sold in Walgreens around $4, Walmart $4, and Target for $5, approximately, for a 50 sheet pack. Just use the clear vertical side "fold" as your bottom edge, and cut to the size of the photo, making a 2 sided, folded photo sleeve. Just make sure the package is labeled "acid free". If it isn't labeled, it isn't acid free. Use your paper trimmer, or paper scissors and straight pins or safety pins to mark where to cut. Ultrahold: Yes, I keep mentioning it. It is made by Therm o Web, HeatnBond, cheapest at Michaels or michaels.com for $10 for a 5 yard roll 17" wide(really 17 1/8" wide, one side has 1/8" less of adhesive running to the edge), you can get 32 pieces / sheets of 8 1/2" x 11" size to run through your inkjet printer ...yes, you read right, you can PRINT your patterns DIRECTLY onto Ultrahold. It is acid free, great for photos, and it is a paper backed, iron on, fabric adhesive, that I have used as my patterns for over 15 years. Believe it or not, I only found out that it could be printed on in May 2015. Had I known, I would've made my frames quicker! Ultrahold pieces are your patterns that back the fabric pieces, they allow for the structures to keep shape, and allow for the frame to stand on a shelf or table. They also, may I add, help keep the frame's shape, after washing. I wouldn't put the frames in the dryer for too long, maybe 15 minutes on low. For washing, you place them in a comfortably fitting lingerie bag, place in the washer, using the cold, delicate cycle, and use mild detergent, no fabric softener. I use Dollar Store Woolwash, works perfect! I also push for my crafters to use store coupons and promo codes, at least 50% off, to save money. Crafters cam buy a 5 yard roll of Ultrahold at Michaels for as little as $5 and cut patterns to make 2 washable, no sew, fabric photo frames for 8x10" photos! If crafters use acetate (dress lining fabric), either use it for the inside panels, or use Therm o Web's HeatnBond Lite EZ Print, double paper sided, inkjet printable sheets, at JoAnn Fabrics or thermowebonline.com - it has less adhesive weight. Other than that, I've used various satins, quilter's cottons, broadcloth (buy a little more broadcloth than mentioned in the download, it shrinks a little when ironed). For thicker fabrics, I'd only use them on the outer facing fabric panels, and a thinner, coordinating, similar fiber type for the inside panels. using mostly acid free materials ( you may have to source acid free fabrics, but if you use organic cotton with pigment based inks, that leans a little more towards helping the photo in the frame). Zazzle.com and spoonflower.com offer incredibly, custom, pigment based ink, printed fabrics, and I have stores on both at http://spoonflower.com/profiles/fabricatedframes & http://zazzle.com/fabricatedframes/fabric so check them out. 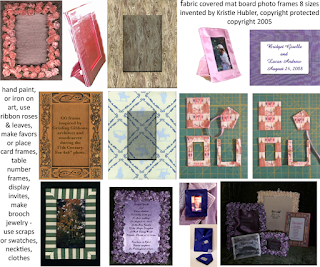 I also offer cut and sews, patterns formatted, to cut out, for all of the parts of the frames, for washable, sewn & no sew frames on Zazzle, in a variety of colors and designs, with all of the circle holes, lines, seam allowances formatted. You can also embellish these frames with buttons, ribbon roses and leaves, beads, etc.! I've hand sewn ribbon roses & leaves, then sewn and hot glued them to my washable, sewn & no sew fabric photo frames, and they wash beautifully! 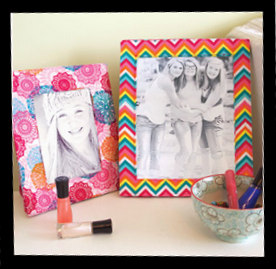 My washable, sewn, fabric photo frames were featured last year in Sew It Today magazine, in their "Framed" tutorial article, using Fabric Loft chevron and medallion fabric patterns by Fabric Editions available at Target. 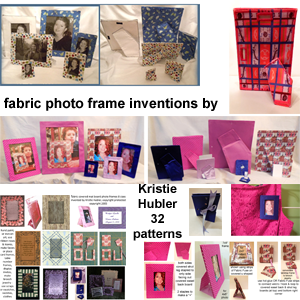 8 sizes, in 4 ways, 32 fabric photo frame patterns! I enjoyed making them, and to be able to make them, for others to make them, not only inexpensively, but to have supplies that are easy to get, at any local art, crafts, or fabric supply store, I think even Walmart carries some of these supplies, is the most amazing thing, plus to make them so that they are washable ...it blows my mind that I invented them. And now, you can, too! My wish is that I helped to make a better, fabric picture frame, and the added icing on the cake, is now you can make them, and the ganache drizzle is that you can add your own touch to them! I have a new, 2016 calendar design, using my own fabric font of letters and numbers, for the days, weekdays, months, and year! Here it is on a sheet of stationery paper, 8 1/2" x 11"
I have a new, 2016 calendar design, using my own fabric font of letters and numbers, for the days, weekdays, months, and year! Here it is on a 40 sheet notepad! I have a new, 2016 calendar design, using my own fabric font of letters and numbers, for the days, weekdays, months, and year! Here it is on FABRIC, 56" wide x 36" long, on a yard of fabric, for cut and sew projects, to make 8 kitchen dish tea towel calendars, and 12 pocket 4x6" wallet purse handbag calendars! I have a new, 2016 calendar design, using my own fabric font of letters and numbers, for the days, weekdays, months, and year! Here it is on a kitchen dish tea towel, 16x24"